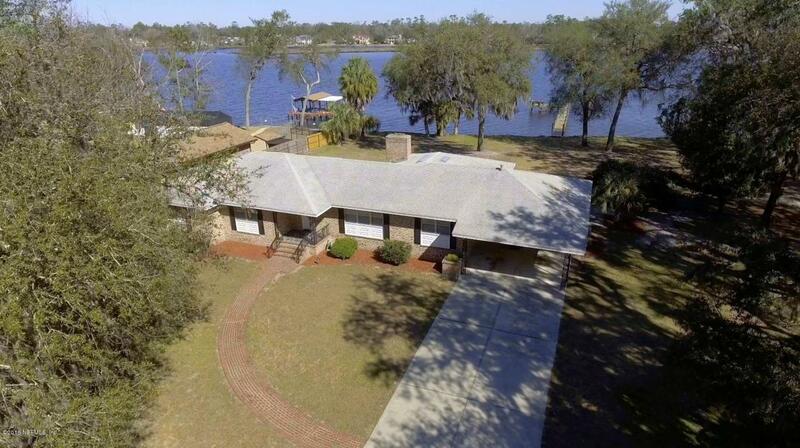 Largest residential parcel (5.2 acres) on the Ortega River. 200 ft on the Ortega River and 400 ft on Ortega Farms Blvd. Owner will consider cutting out 90 X 775 (1.6 acres) waterfront lot at price of $385,000. Southern living with numerous mature live oak trees with a Spanish moss canopy. Favorable flood zone X for existing house and vacant lot. Beautiful high & dry waterfront! 4 bedroom 3 bath brick home with many updates. Original hardwood floor in bedrooms recently refinished. Beautiful river view from full glass panels in 28'4 x 13'8 River Room with polished terrazzo floor. 112 ft long dock has 300 sq ft deck with benches. 24 X 12 shed. Several palm trees. Beautiful sun rise over the Ortega River. One of a kind!!! New Floridan 560 ft deep well with all new equipment installed in 2018.